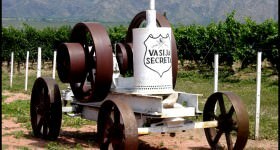 As the second biggest wine region in Argentina, San Juan is the source of one in five bottles of Argentine wine and has around 50,000 hectares (120,000 acres) of vineyards. 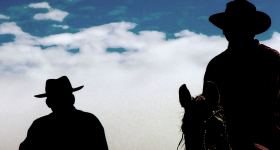 The first plantings were made by the Spanish soon after the city of San Juan de la Frontera was founded in 1562, and probably a few decades before vines spread further south. Its longest surviving winery, Graffigna, was founded by an Italian immigrant, Santiago Graffigna, in 1870 and is the second oldest in Argentina. 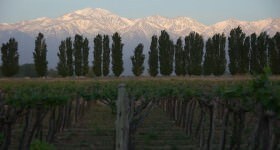 Yet by the early 20th century, Mendoza had consolidated its grip on the country’s wine industry and its northern neighbour had been pushed firmly into the shade. 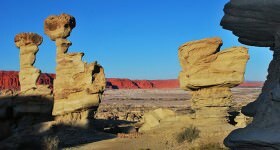 The province of San Juan together with Mendoza and La Rioja forms what the Huarpe indians called the Cuyo – ‘the land of deserts’. Driving through this parched, barren landscape the idea of growing anything as juicy as a grape seems far-fetched, especially by the time you reach the border of San Juan. 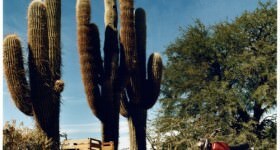 It is just over an hour north from the city of Mendoza and a few degrees hotter. 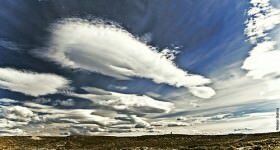 Annual rainfall averages just four inches and the sun shimmers down from cloudless skies for up to 330 days a year. Pedernal Valley in San Juan Province; Photo courtesy of Finca Las Moras. 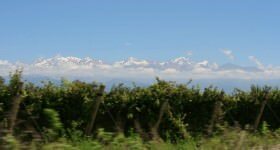 As throughout the Cuyo, vineyards only exist thanks to the network of irrigation channels that fan out from the small oases in the desert that are fed by underground springs and rivers. 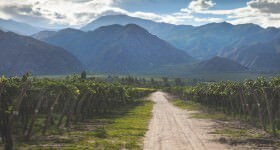 At present most of the vineyards are in the Tulum Valley north of the San Juan river between the Andean peaks of the Cerro del Pie de Palo and the Cerro Chico del Zonda. 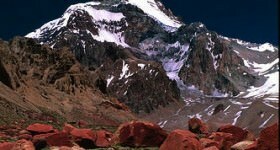 At an altitude of 650m (2,100 ft) temperatures can hit 42C (107F) in mid-summer, cooling to around 16C (60F) by night. 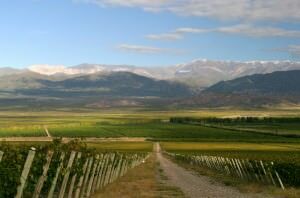 As a result it was easy to produce big volumes of bulk wine for bottling as generic Argentine red wine. 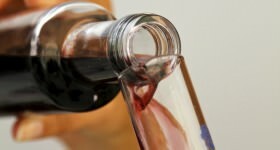 Plenty of what is produced here still ends up in a blending vat in Mendoza, but an increasing amount is being bottled in San Juan by more enlightened producers who proudly stamp the wine’s provenance on the label. 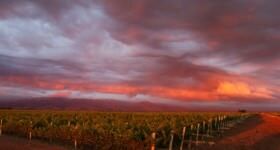 Producing Malbecs as fresh as those from the cooler, high altitude vineyards of Mendoza is a challenge, but the region is considered one of the best places in Argentina for growing Shiraz, or Syrah. As well as the Tulum Valley, there are some lovely wines from the nearby valleys of Calingasta and Ulum-Zonda to the south where it is just as steamy by day, but a couple of degrees cooler at night thanks to being a few hundred metres higher up. By style San Juan Shiraz tends to be full of dense black fruits and peppery spice, sometimes with notes of liquorice and leather. It is closer to a full-bodied Australian Shiraz from the Barossa than a leaner, more sinewey French Syrah from the Rhône. Among producers to look out for are Finca Las Moras, Callia, Rewen, Casa Montes and Ayllus whose Syrahs pop up on good restaurant lists in Argentina and occasionally beyond. From a modest base exports are growing. These vineyards also produce white wines, of which possibly the most interesting is Viognier, whose ripe tropical fruit is kept fresh with a crisp, zesty finish. 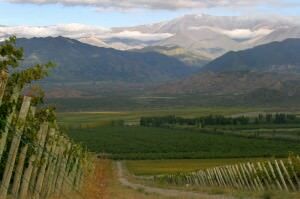 But as throughout Argentina, if you want to be taken seriously as a wine region you are judged on your Malbec, and here San Juan has a trump card in the shape of the 1400m (4,600 ft) Pedernal Valley. 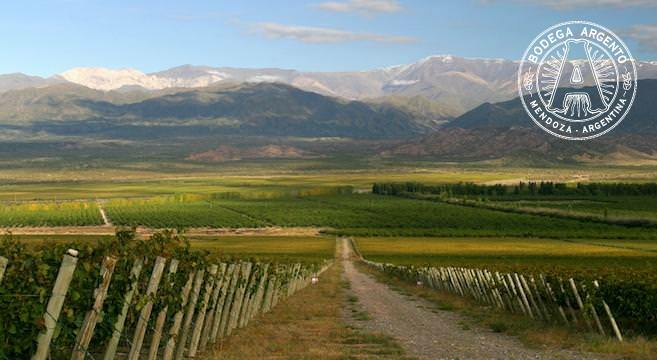 According to Gustavo Arroyat of Finca las Moras, it is “one of the three main valleys flying the flag for high-altitude wine in Argentina.” The others being Mendoza’s Uco Valley and Cafayate in Salta. 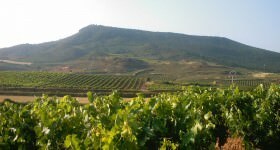 So far the vineyards extend to just 350 hectares (860 acres) but the number is growing, as is the excitement among top consultant winemakers like Roberto de la Mota. Pedernal is Spanish for flint-stone – the thin black rock exposed by the glacier that gouged out the valley many aeons ago. The rock retains some warmth for the vines when temperatures plummet beneath the clear night skies, and can add a trace of minerality to the wines. On one side of the valley the vineyards catch the early morning sun, on the other they ripen later into the day producing slightly richer wines as a result. By carefully blending different parcels one can create some beautifully balanced wine. A point proven by Arroyat’s Mora Negra Malbec which has just been crowned ‘best Southern hemisphere Malbec’ at Vinexpo in Hong Kong.